Thank you for making this such a beautiful event, New York! Meet at the Cube. Rain or shine. 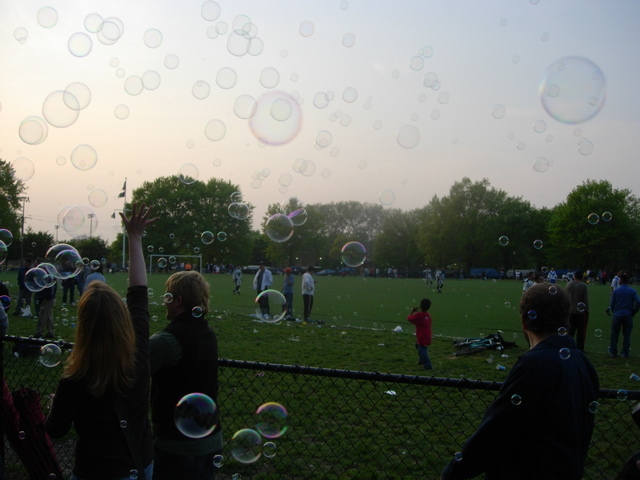 Millions of bubbles fill the sky as we rally at the Cube for a massive bubble battle! 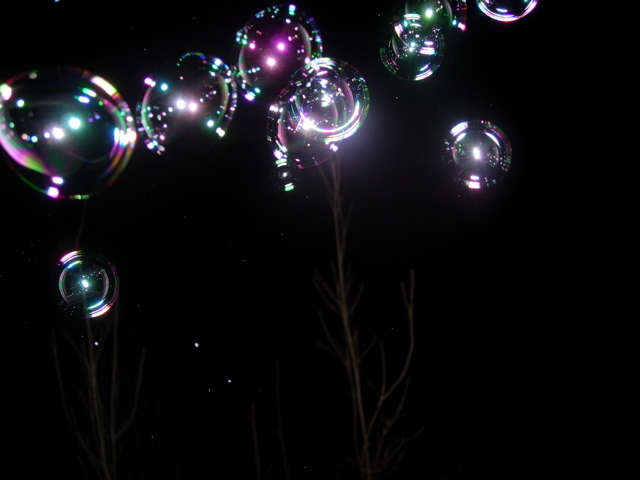 Beautiful bubbles glimmer and shimmer as the wind carries them in an enchanting dance. 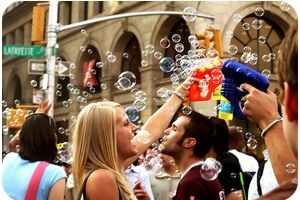 Join us at 6:16pm with your wildest toys and let the bubbles soar! 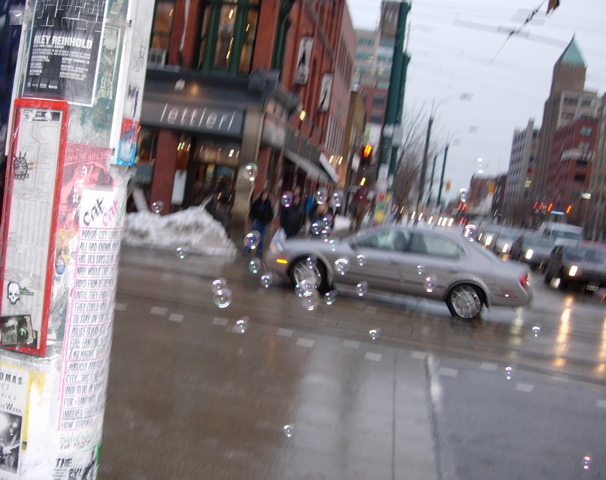 Bubble solution can be bought in a store or made at home: see the recipes below. AA batteries will come in handy for the bubble guns and machines. If you have a camera, this event will make for excellent photography! 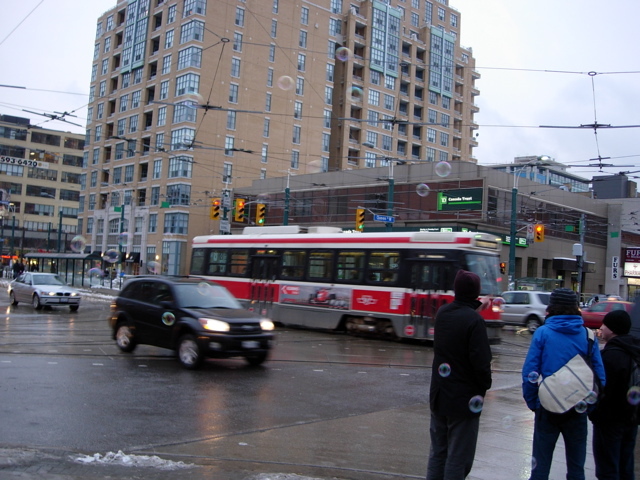 In general, one part Dawn or Joy dishwashing soap and fifteen parts water makes an excellent small bubble solution. 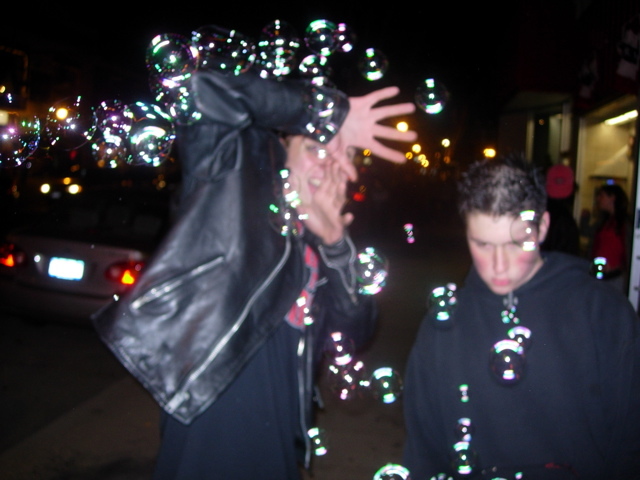 If you want larger bubbles, however, check out this link. 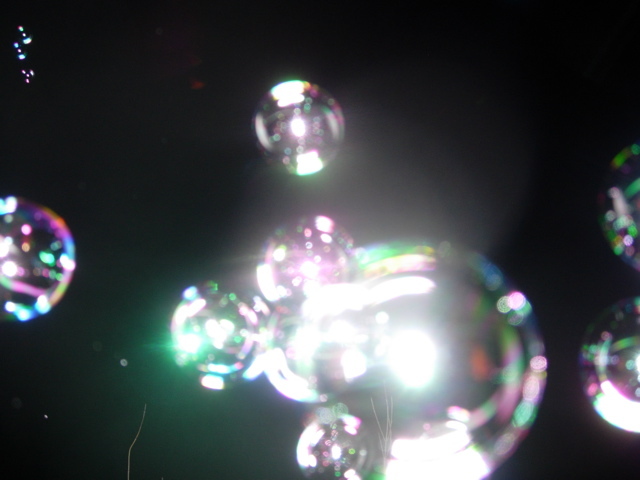 bubbles are among the purest forms of joy and freedom; otherwise, they wouldn't attract such obvious universal love. 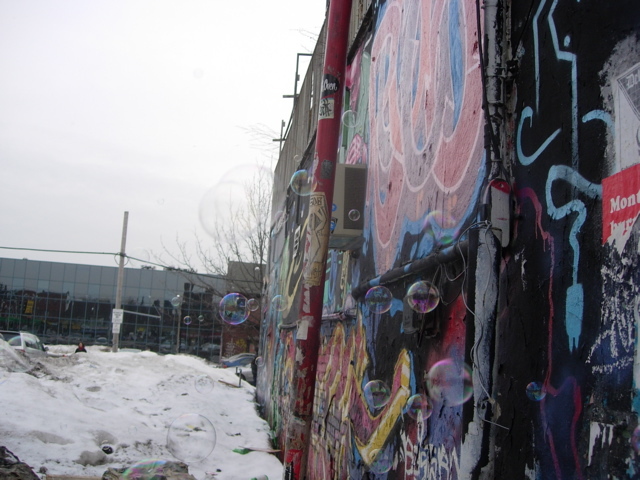 bubbles are temporary art, ejaculations of flight that drift on currents of wind hither and thither, meant to be not viewed like a gallery's painting but beheld. 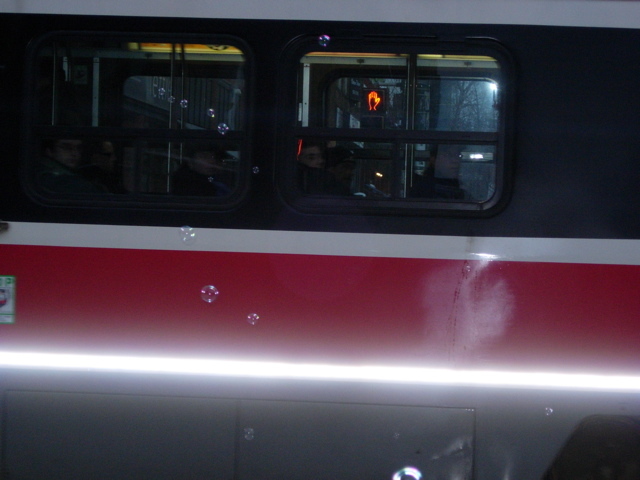 using various devices, we have produced large displays of bubbles on several occassions, including the firstwarmnight street festival. 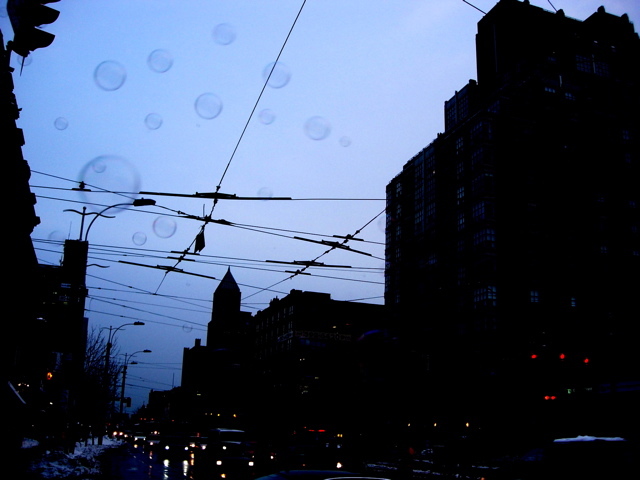 simply walking down the street with a humming bubble gun or machine in tow transforms you into a happiness delinquent, a love soldier in a war on the mundane and unhappy. our next plan is to bubble the entire brooklyn bridge! it is ambitious, certainly; american bridges and tunnels are among the most highly-guarded infrastructures in the world and photography has recently been banned within a considerable distance. not to mention, it's really long. comments: 1629. This is page 1 of 4. &#1052;&#1077;&#1090;&#1080;&#1086;&#1085;&#1080;&#1085;. &#1053;&#1077;&#1079;&#1072;&#1084;&#1077;&#1085;&#1080;&#1084;&#1072;&#1103; &#1072;&#1084;&#1080;&#1085;&#1086;&#1082;&#1080;&#1089;&#1083;&#1086;&#1090;&#1072;. &#1061;&#1086;&#1088;&#1086;&#1096;&#1080;&#1077; &#1080;&#1089;&#1090;&#1086;&#1095;&#1085;&#1080;&#1082;&#1080; - &#1079;&#1077;&#1088;&#1085;&#1086;&#1074;&#1099;&#1077;, &#1086;&#1088;&#1077;&#1093;&#1080; &#1080; &#1079;&#1083;&#1072;&#1082;&#1086;&#1074;&#1099;&#1077;. &#1042;&#1072;&#1078;&#1077;&#1085; &#1074; &#1084;&#1077;&#1090;&#1072;&#1073;&#1086;&#1083;&#1080;&#1079;&#1084;&#1077; &#1078;&#1080;&#1088;&#1086;&#1074; &#1080; &#1073;&#1077;&#1083;&#1082;&#1086;&#1074;, &#1080;&#1075;&#1088;&#1072; &#1080;&#1089;&#1087;&#1086;&#1083;&#1100;&#1079;&#1091;&#1077;&#1090; &#1077;&#1077; &#1090;&#1072;&#1082;&#1078;&#1077; &#1076;&#1083;&#1103; &#1087;&#1088;&#1086;&#1080;&#1079;&#1074;&#1086;&#1076;&#1089;&#1090;&#1074;&#1072; &#1094;&#1080;&#1089;&#1090;&#1077;&#1080;&#1085;&#1072;. &#1071;&#1074;&#1083;&#1103;&#1077;&#1090;&#1089;&#1103; &#1086;&#1089;&#1085;&#1086;&#1074;&#1085;&#1099;&#1084; &#1087;&#1086;&#1089;&#1090;&#1072;&#1074;&#1097;&#1080;&#1082;&#1086;&#1084; &#1089;&#1091;&#1083;&#1100;&#1092;&#1091;&#1088;&#1072;, &#1082;&#1086;&#1090;&#1086;&#1088;&#1099;&#1081; &#1087;&#1088;&#1077;&#1076;&#1086;&#1090;&#1074;&#1088;&#1072;&#1097;&#1072;&#1077;&#1090; &#1088;&#1072;&#1089;&#1089;&#1090;&#1088;&#1086;&#1081;&#1089;&#1090;&#1074;&#1072; &#1074; &#1092;&#1086;&#1088;&#1084;&#1080;&#1088;&#1086;&#1074;&#1072;&#1085;&#1080;&#1080; &#1074;&#1086;&#1083;&#1086;&#1089;, &#1082;&#1086;&#1078;&#1080; &#1080; &#1085;&#1086;&#1075;&#1090;&#1077;&#1081;; &#1089;&#1087;&#1086;&#1089;&#1086;&#1073;&#1089;&#1090;&#1074;&#1091;&#1077;&#1090; &#1087;&#1086;&#1085;&#1080;&#1078;&#1077;&#1085;&#1080;&#1102; &#1091;&#1088;&#1086;&#1074;&#1085;&#1103; &#1093;&#1086;&#1083;&#1077;&#1089;&#1090;&#1077;&#1088;&#1080;&#1085;&#1072;, &#1091;&#1089;&#1080;&#1083;&#1080;&#1074;&#1072;&#1103; &#1074;&#1099;&#1088;&#1072;&#1073;&#1086;&#1090;&#1082;&#1091; &#1083;&#1077;&#1094;&#1080;&#1090;&#1080;&#1085;&#1072; &#1087;&#1077;&#1095;&#1077;&#1085;&#1100;&#1102;; &#1087;&#1086;&#1085;&#1080;&#1078;&#1072;&#1077;&#1090; &#1091;&#1088;&#1086;&#1074;&#1077;&#1085;&#1100; &#1078;&#1080;&#1088;&#1086;&#1074; &#1074; &#1087;&#1077;&#1095;&#1077;&#1085;&#1080;, &#1079;&#1072;&#1097;&#1080;&#1097;&#1072;&#1077;&#1090; &#1087;&#1086;&#1095;&#1082;&#1080;; &#1091;&#1095;&#1072;&#1089;&#1090;&#1074;&#1091;&#1077;&#1090; &#1074; &#1074;&#1099;&#1074;&#1086;&#1076;&#1077; &#1090;&#1103;&#1078;&#1077;&#1083;&#1099;&#1093; &#1084;&#1077;&#1090;&#1072;&#1083;&#1083;&#1086;&#1074; &#1080;&#1079; &#1085;&#1072;&#1087;&#1091;&#1076;&#1088;&#1080;&#1074;&#1072;&#1085;&#1080;&#1103; MAKE UP; &#1088;&#1077;&#1075;&#1091;&#1083;&#1080;&#1088;&#1091;&#1077;&#1090; &#1086;&#1073;&#1088;&#1072;&#1079;&#1086;&#1074;&#1072;&#1085;&#1080;&#1077; &#1072;&#1084;&#1084;&#1080;&#1072;&#1082;&#1072; &#1080; &#1086;&#1095;&#1080;&#1097;&#1072;&#1077;&#1090; &#1086;&#1090; &#1085;&#1077;&#1075;&#1086; &#1084;&#1086;&#1095;&#1091;, &#1095;&#1090;&#1086; &#1087;&#1086;&#1085;&#1080;&#1078;&#1072;&#1077;&#1090; &#1085;&#1072;&#1075;&#1088;&#1091;&#1079;&#1082;&#1091; &#1085;&#1072; &#1084;&#1086;&#1095;&#1077;&#1074;&#1086;&#1081; &#1087;&#1091;&#1079;&#1099;&#1088;&#1100;; &#1074;&#1086;&#1079;&#1076;&#1077;&#1081;&#1089;&#1090;&#1074;&#1091;&#1077;&#1090; &#1085;&#1072; &#1083;&#1091;&#1082;&#1086;&#1074;&#1080;&#1094;&#1099; &#1074;&#1086;&#1083;&#1086;&#1089; &#1080; &#1087;&#1086;&#1076;&#1076;&#1077;&#1088;&#1078;&#1080;&#1074;&#1072;&#1077;&#1090; &#1088;&#1086;&#1089;&#1090; &#1074;&#1086;&#1083;&#1086;&#1089;. &#1043;&#1086;&#1088;&#1084;&#1086;&#1085;&#1072;&#1083;&#1100;&#1085;&#1099;&#1077; &#1089;&#1073;&#1086;&#1080; &#1076;&#1072;&#1102;&#1090; &#1087;&#1088;&#1086;&#1073;&#1083;&#1077;&#1084;&#1099; &#1083;&#1102;&#1076;&#1103;&#1084;, &#1082;&#1086;&#1090;&#1086;&#1088;&#1099;&#1077; &#1095;&#1072;&#1089;&#1090;&#1086; &#1087;&#1088;&#1080;&#1089;&#1091;&#1097;&#1080; &#1083;&#1080;&#1096;&#1100; &#1078;&#1077;&#1085;&#1097;&#1080;&#1085;&#1072;&#1084;. &#1048;&#1085;&#1086;&#1075;&#1076;&#1072; &#1101;&#1090;&#1080; &#1087;&#1088;&#1086;&#1073;&#1083;&#1077;&#1084;&#1099; &#1085;&#1077; &#1091;&#1075;&#1088;&#1086;&#1078;&#1072;&#1102;&#1090; &#1078;&#1080;&#1079;&#1085;&#1080;, &#1085;&#1086; &#1087;&#1088;&#1080;&#1095;&#1080;&#1085;&#1103;&#1102;&#1090; &#1093;&#1083;&#1086;&#1087;&#1086;&#1090; &#1080; &#1076;&#1077;&#1083;&#1072;&#1102;&#1090; &#1078;&#1080;&#1079;&#1085;&#1100; &#1085;&#1077;&#1091;&#1076;&#1086;&#1073;&#1085;&#1086;&#1081;. &#1048;&#1079;&#1084;&#1077;&#1085;&#1077;&#1085;&#1080;&#1103; &#1075;&#1086;&#1088;&#1084;&#1086;&#1085;&#1072;&#1083;&#1100;&#1085;&#1086;&#1075;&#1086; &#1092;&#1086;&#1085;&#1072; &#1074;&#1083;&#1080;&#1103;&#1102;&#1090; &#1085;&#1072; &#1088;&#1077;&#1087;&#1088;&#1086;&#1076;&#1091;&#1082;&#1090;&#1080;&#1074;&#1085;&#1091;&#1102; &#1092;&#1091;&#1085;&#1082;&#1094;&#1080;&#1102;, &#1088;&#1072;&#1079;&#1074;&#1080;&#1074;&#1072;&#1102;&#1090;&#1089;&#1103; &#1088;&#1072;&#1079;&#1083;&#1080;&#1095;&#1085;&#1099;&#1077; &#1073;&#1086;&#1083;&#1077;&#1079;&#1085;&#1080; &#1091; &#1078;&#1077;&#1085;&#1097;&#1080;&#1085;, &#1082;&#1086;&#1090;&#1086;&#1088;&#1099;&#1077; &#1084;&#1086;&#1075;&#1091;&#1090; &#1087;&#1086;&#1074;&#1083;&#1080;&#1103;&#1090;&#1100; &#1080; &#1085;&#1072; &#1088;&#1086;&#1078;&#1076;&#1077;&#1085;&#1080;&#1077; &#1076;&#1077;&#1090;&#1077;&#1081;. &#1046;&#1077;&#1085;&#1089;&#1082;&#1086;&#1077; &#1079;&#1076;&#1086;&#1088;&#1086;&#1074;&#1100;&#1077; &#8211; &#1101;&#1090;&#1086; &#1085;&#1077; &#1087;&#1088;&#1086;&#1089;&#1090;&#1086; &#1089;&#1086;&#1089;&#1090;&#1072;&#1074;&#1083;&#1103;&#1102;&#1097;&#1072;&#1103; &#1095;&#1072;&#1089;&#1090;&#1100; &#1078;&#1080;&#1079;&#1085;&#1080; &#1086;&#1090;&#1076;&#1077;&#1083;&#1100;&#1085;&#1086;&#1081; &#1078;&#1077;&#1085;&#1097;&#1080;&#1085;&#1099;, &#1101;&#1090;&#1086; &#1073;&#1091;&#1076;&#1091;&#1097;&#1077;&#1077; &#1086;&#1073;&#1097;&#1077;&#1089;&#1090;&#1074;&#1072;, &#1079;&#1076;&#1086;&#1088;&#1086;&#1074;&#1100;&#1077; &#1076;&#1077;&#1090;&#1077;&#1081; &#1080; &#1089;&#1077;&#1084;&#1100;&#1080;, &#1087;&#1086;&#1090;&#1086;&#1084;&#1091; &#1085;&#1077; &#1089;&#1090;&#1086;&#1080;&#1090; &#1086;&#1090;&#1082;&#1083;&#1072;&#1076;&#1099;&#1074;&#1072;&#1090;&#1100; &#1087;&#1088;&#1086;&#1073;&#1083;&#1077;&#1084;&#1099; &#1090;&#1072;&#1082;&#1086;&#1075;&#1086; &#1088;&#1086;&#1076;&#1072; &#1085;&#1072; &#1087;&#1086;&#1090;&#1086;&#1084;. &#1051;&#1102;&#1073;&#1099;&#1077; &#1087;&#1077;&#1088;&#1077;&#1084;&#1077;&#1085;&#1099;, &#1075;&#1086;&#1088;&#1084;&#1086;&#1085;&#1072;&#1083;&#1100;&#1085;&#1099;&#1081; &#1089;&#1073;&#1086;&#1081;, &#1087;&#1077;&#1088;&#1077;&#1073;&#1086;&#1080; &#1088;&#1072;&#1073;&#1086;&#1090;&#1099; &#1087;&#1086;&#1083;&#1086;&#1074;&#1099;&#1093; &#1086;&#1088;&#1075;&#1072;&#1085;&#1086;&#1074; &#1076;&#1086;&#1083;&#1078;&#1085;&#1099; &#1073;&#1099;&#1090;&#1100; &#1087;&#1086;&#1074;&#1086;&#1076;&#1086;&#1084; &#1086;&#1073;&#1088;&#1072;&#1097;&#1077;&#1085;&#1080;&#1103; &#1082; &#1074;&#1088;&#1072;&#1095;&#1091;. &#1047;&#1072;&#1087;&#1080;&#1089;&#1072;&#1090;&#1100;&#1089;&#1103; &#1082; &#1076;&#1086;&#1082;&#1090;&#1086;&#1088;&#1091;, &#1087;&#1088;&#1086;&#1081;&#1090;&#1080; &#1074;&#1089;&#1077; &#1080;&#1089;&#1089;&#1083;&#1077;&#1076;&#1086;&#1074;&#1072;&#1085;&#1080;&#1103;, &#1087;&#1086;&#1085;&#1103;&#1090;&#1100;, &#1095;&#1090;&#1086; &#1087;&#1088;&#1086;&#1080;&#1089;&#1093;&#1086;&#1076;&#1080;&#1090; &#1084;&#1086;&#1078;&#1085;&#1086; &#1089; &#1087;&#1086;&#1084;&#1086;&#1097;&#1100;&#1102; &#1074;&#1077;&#1073;&#1089;&#1072;&#1081;&#1090;&#1072; woman-help.ru, &#1075;&#1076;&#1077; &#1076;&#1072;&#1085;&#1072; &#1080;&#1089;&#1095;&#1077;&#1088;&#1087;&#1099;&#1074;&#1072;&#1102;&#1097;&#1072;&#1103; &#1080;&#1085;&#1092;&#1086;&#1088;&#1084;&#1072;&#1094;&#1080;&#1103; &#1086; &#1084;&#1085;&#1086;&#1075;&#1086;&#1084;, &#1095;&#1090;&#1086; &#1080;&#1085;&#1090;&#1077;&#1088;&#1077;&#1089;&#1091;&#1077;&#1090; &#1078;&#1077;&#1085;&#1097;&#1080;&#1085;. &#1047;&#1076;&#1077;&#1089;&#1100; &#1084;&#1086;&#1078;&#1085;&#1086; &#1085;&#1077; &#1083;&#1080;&#1096;&#1100; &#1086;&#1079;&#1085;&#1072;&#1082;&#1086;&#1084;&#1080;&#1090;&#1100;&#1089;&#1103; &#1089;&#1086; &#1074;&#1089;&#1077;&#1084;&#1080; &#1101;&#1092;&#1092;&#1077;&#1082;&#1090;&#1080;&#1074;&#1085;&#1099;&#1084;&#1080; &#1089;&#1087;&#1086;&#1089;&#1086;&#1073;&#1072;&#1084;&#1080; &#1083;&#1077;&#1095;&#1077;&#1085;&#1080;&#1103; &#1080; &#1074;&#1099;&#1103;&#1074;&#1083;&#1077;&#1085;&#1080;&#1103; &#1087;&#1088;&#1086;&#1073;&#1083;&#1077;&#1084; &#1078;&#1077;&#1085;&#1089;&#1082;&#1086;&#1075;&#1086; &#1079;&#1076;&#1086;&#1088;&#1086;&#1074;&#1100;&#1103;, &#1085;&#1086; &#1080; &#1085;&#1072;&#1081;&#1090;&#1080; &#1072;&#1076;&#1088;&#1077;&#1089;&#1072; &#1094;&#1077;&#1085;&#1090;&#1088;&#1086;&#1074; &#1080; &#1091;&#1079;&#1085;&#1072;&#1090;&#1100; &#1086; &#1074;&#1077;&#1076;&#1091;&#1097;&#1080;&#1093; &#1089;&#1087;&#1077;&#1094;&#1080;&#1072;&#1083;&#1080;&#1089;&#1090;&#1072;&#1093; &#1074; &#1089;&#1092;&#1077;&#1088;&#1077; &#1075;&#1080;&#1085;&#1077;&#1082;&#1086;&#1083;&#1086;&#1075;&#1080;&#1080;. &#1057;&#1088;&#1072;&#1079;&#1091; &#1085;&#1072; &#1089;&#1072;&#1081;&#1090;&#1077; &#1084;&#1086;&#1078;&#1085;&#1086; &#1079;&#1072;&#1087;&#1080;&#1089;&#1072;&#1090;&#1100;&#1089;&#1103; &#1082; &#1083;&#1102;&#1073;&#1086;&#1084;&#1091; &#1074;&#1088;&#1072;&#1095;&#1091;, &#1072; &#1090;&#1072;&#1082;&#1078;&#1077; &#1087;&#1088;&#1086;&#1082;&#1086;&#1085;&#1089;&#1091;&#1083;&#1100;&#1090;&#1080;&#1088;&#1086;&#1074;&#1072;&#1090;&#1100;&#1089;&#1103; &#1087;&#1086; &#1079;&#1072;&#1073;&#1086;&#1083;&#1077;&#1074;&#1072;&#1085;&#1080;&#1103;&#1084; &#1080; &#1087;&#1088;&#1086;&#1093;&#1086;&#1078;&#1076;&#1077;&#1085;&#1080;&#1102; &#1074;&#1089;&#1077;&#1093; &#1090;&#1088;&#1077;&#1073;&#1091;&#1077;&#1084;&#1099;&#1093; &#1083;&#1072;&#1073;&#1086;&#1088;&#1072;&#1090;&#1086;&#1088;&#1085;&#1099;&#1093; &#1072;&#1085;&#1072;&#1083;&#1080;&#1079;&#1086;&#1074;. &#1053;&#1072;&#1096;&#1080; &#1076;&#1072;&#1083;&#1100;&#1085;&#1080;&#1077; &#1087;&#1088;&#1077;&#1076;&#1082;&#1080; &#1073;&#1099;&#1083;&#1080; &#1073;&#1086;&#1083;&#1100;&#1096;&#1080;&#1084;&#1080; &#1074;&#1099;&#1076;&#1091;&#1084;&#1097;&#1080;&#1082;&#1072;&#1084;&#1080;. &#1048;&#1079;&#1074;&#1077;&#1089;&#1090;&#1085;&#1086;, &#1095;&#1090;&#1086; &#1085;&#1077;&#1089;&#1082;&#1086;&#1083;&#1100;&#1082;&#1086; &#1090;&#1099;&#1089;&#1103;&#1095;&#1077;&#1083;&#1077;&#1090;&#1080;&#1081; &#1085;&#1072;&#1079;&#1072;&#1076; &#1074; &#1093;&#1088;&#1072;&#1084;&#1077; &#1072;&#1089;&#1089;&#1080;&#1088;&#1080;&#1081;&#1089;&#1082;&#1086;&#1081; &#1073;&#1086;&#1075;&#1080;&#1085;&#1080; &#1048;&#1096;&#1090;&#1072;&#1088; &#1089;&#1083;&#1091;&#1078;&#1080;&#1090;&#1077;&#1083;&#1100;&#1085;&#1080;&#1094;&#1099; &#1082;&#1091;&#1083;&#1100;&#1090;&#1072; &#1087;&#1088;&#1072;&#1082;&#1090;&#1080;&#1082;&#1086;&#1074;&#1072;&#1083;&#1080; &#1086;&#1073;&#1088;&#1103;&#1076; &#1076;&#1077;&#1092;&#1083;&#1086;&#1088;&#1072;&#1094;&#1080;&#1080; &#1089; &#1087;&#1086;&#1084;&#1086;&#1097;&#1100;&#1102; &#1089;&#1087;&#1077;&#1094;&#1080;&#1072;&#1083;&#1100;&#1085;&#1086;&#1075;&#1086; &#1078;&#1077;&#1079;&#1083;&#1072; &#1074; &#1092;&#1086;&#1088;&#1084;&#1077; &#1092;&#1072;&#1083;&#1083;&#1086;&#1089;&#1072;. &#1053;&#1072; &#1076;&#1088;&#1091;&#1075;&#1086;&#1084; &#1082;&#1086;&#1085;&#1094;&#1077; &#1089;&#1074;&#1077;&#1090;&#1072; (&#1074; &#1055;&#1077;&#1088;&#1091;) &#1080; &#1075;&#1086;&#1088;&#1072;&#1079;&#1076;&#1086; &#1087;&#1086;&#1079;&#1078;&#1077; &#1084;&#1072;&#1090;&#1077;&#1088;&#1080; &#1083;&#1080;&#1096;&#1072;&#1083;&#1080; &#1076;&#1077;&#1074;&#1089;&#1090;&#1074;&#1077;&#1085;&#1085;&#1086;&#1089;&#1090;&#1080; &#1089;&#1074;&#1086;&#1080;&#1093; &#1076;&#1086;&#1095;&#1077;&#1088;&#1077;&#1081; &#1074; &#1086;&#1073;&#1097;&#1077;&#1089;&#1090;&#1074;&#1077;&#1085;&#1085;&#1099;&#1093; &#1084;&#1077;&#1089;&#1090;&#1072;&#1093;... &#1054;&#1076;&#1085;&#1072;&#1082;&#1086;, &#1095;&#1072;&#1097;&#1077; &#1074;&#1089;&#1077;&#1075;&#1086;, &#1086;&#1073;&#1088;&#1103;&#1076; &#1076;&#1077;&#1092;&#1083;&#1086;&#1088;&#1072;&#1094;&#1080;&#1080; &#1087;&#1088;&#1086;&#1074;&#1086;&#1076;&#1080;&#1083;&#1080; &#1084;&#1091;&#1078;&#1095;&#1080;&#1085;&#1099;. &#1054;&#1087;&#1080;&#1089;&#1072;&#1085;&#1080;&#1077; &#1101;&#1090;&#1086;&#1075;&#1086; &#1076;&#1077;&#1081;&#1089;&#1090;&#1074;&#1072; &#1082;&#1088;&#1072;&#1081;&#1085;&#1077; &#1085;&#1072;&#1087;&#1086;&#1084;&#1080;&#1085;&#1072;&#1083;&#1086; &#1075;&#1088;&#1091;&#1087;&#1087;&#1086;&#1074;&#1086;&#1077; &#1080;&#1079;&#1085;&#1072;&#1089;&#1080;&#1083;&#1086;&#1074;&#1072;&#1085;&#1080;&#1077;. &#1055;&#1086;&#1078;&#1072;&#1083;&#1091;&#1081;, &#1089;&#1072;&#1084;&#1099;&#1081; &#171;&#1088;&#1086;&#1084;&#1072;&#1085;&#1090;&#1080;&#1095;&#1085;&#1099;&#1081;&#187; &#1074;&#1072;&#1088;&#1080;&#1072;&#1085;&#1090; &#1087;&#1086;&#1076;&#1086;&#1073;&#1085;&#1086;&#1075;&#1086; &#1086;&#1073;&#1088;&#1103;&#1076;&#1072;: &#1076;&#1077;&#1074;&#1091;&#1096;&#1082;&#1091; &#1086;&#1090;&#1087;&#1088;&#1072;&#1074;&#1083;&#1103;&#1083;&#1080; &#1074; &#1083;&#1077;&#1089;, &#1095;&#1090;&#1086;&#1073;&#1099; &#1077;&#1077; &#1083;&#1080;&#1096;&#1080;&#1083; &#1076;&#1077;&#1074;&#1089;&#1090;&#1074;&#1077;&#1085;&#1085;&#1086;&#1089;&#1090;&#1080; &#1084;&#1077;&#1089;&#1090;&#1085;&#1099;&#1081; &#1086;&#1090;&#1096;&#1077;&#1083;&#1100;&#1085;&#1080;&#1082; &#1074; &#1079;&#1074;&#1077;&#1088;&#1080;&#1085;&#1086;&#1081; &#1096;&#1082;&#1091;&#1088;&#1077; &#1080; &#1088;&#1086;&#1075;&#1072;&#1084;&#1080;, &#1087;&#1088;&#1080;&#1074;&#1103;&#1079;&#1072;&#1085;&#1085;&#1099;&#1084;&#1080; &#1082; &#1075;&#1086;&#1083;&#1086;&#1074;&#1077;. Gordon Willis had no use for the Hollywood scene. Yet he was one of the most sought-after cinematographers by the biggest film directors of all time. d une Eglise chr�tienne (catholique) ne permettent pas � cet imam format� de l accuser d ing�rence , de plus cet imam devrait conna?tre sa propre religion qui exhorte � l intervention contre l injustice : le pape , comme tout homme soucieux de la s�curit� de ses semblables est l�gitimement fond� � manifester son inqui�tude , � appeler � l action pour faire cesser l injustice criminelle . ????????? ????????????????????????????? ?11.550 ?????????????????????? ????????????????????????????????????????????????????????? choose the best partition recovery answer for you , please see the details info ! 20120718? ?2 440?? ???? ?978-4091237729 ????????? ????????????????????????????????????5?????? ????????????????????????????????????????c??????????????????????????????????????????????????????????????????????????????????????????????????? ? ?----------------------- ????????????????????? ?, ???????? 2 ?????????????? ?????????? ???????????? ?12 ???????????????????? ?????????d??????????? ?, ?????????????? ???????????????????????????????????????????????????? ????????????????????????????????? ???????????????????? 5????????????c??????? ???????????????? ?49 ????????????????????????3??????????? ???????? ??????????? 5??????c???????????? 5??????????????????4??????�???????????????????????????????????????????????? 12??????????????????????????????????????? 5??????????????????????????? ????????????? ?, ???? ?????????????? ????�????????? ????????????c?????????????????????? ???????? ???????? ????????????????12?????????????? ?????????????????????????? ?????????????? ?????????????? ?????????????? ?????????????????????????????? ????????????????c??????? ??????????????????????? ?????????????? ?????????? 13?????????? ????????????????? ???????? 11???????? 13???????????????? ?????????????????????????????????-??????????????????? ??????????? 10??? ?1 ????????????????? ?????? ?35 ??????????????????????????????? ??????????4???????? ???????????????????????????????????????????? ???????????????????????????????4??????????? ???????????????????????????????????? ?????????????????? 11????????????c??????? ??????�??????12??????????????????????????????????????�???????????????????????�? ??????????? ????????????????????????????????????????????? ??????????????????????????????? ????????????? ????????????????? ?????????????? ? ?----------------------- ??????????24???????????? ???????????????????????????????????????????????????????????????????1????????????????????? ???????????????????????????????????????? ???????????????????????????? ???????????????????????????????????????????????????????????????????????????????????????c????????????????????????????????????????????�???????c????????????????????????????????????????????????????????????????? ??????????????????????????c???????????????????????????????????????????????????????????????????????c???????????????????????????????????????????????????????????c?????�???????????????????????????????????????c???????????? ?????????????????????????????? THE countdown to SuperCoach 2012 is on the battle for ultimate footy bragging rights starts tomorrow Last season more than 400,000 footy fans signed up for the chance to win the $50,000 grand prize and thousands of dollars in other prizes during the year. ???????? ??????????????????c??????????????????? ???????c?????????????????????????????????????????c???????????????????????? ????????????????????? ???????????????????c??????????????? ????? ???????40127590210??? ?5,000 + ???????40126360110? ?40,000 + ?????????????c????????c? ????????????????????????????? ????????40165180210?? ?55,000+ ???????????????????????????????????????????????????c???? ??40127710110?? ?69,000+ ??40120400100?? ?12,500+ ??????????????????????�?????? ??40165320110???11,000?? la dette souveraine, celle des �tats, p�se toujours sur les march�s financiers. Il vit en Californie avec son &#233;pouse Gabriella et leur premier b&#233;b&#233;. [.] Demi Moore, Beyonc&#233;, Jennifer Aniston, Juliette Binoche. protezione dei dispositivi mobili sui tratti comportamentali e fisiologici che appartengono ad un singolo individuo e a nessun altro. retraites et dans la d�pendance, Si elle N. SARKOZY . Thanks for the strategies presented. One thing I also believe is that credit cards providing a 0% interest rate often lure consumers with zero interest, instant acceptance and easy internet balance transfers, however beware of the main factor that will certainly void the 0% easy streets annual percentage rate and also throw one out into the bad house rapidly. I actually firmly believe the cornerstone of your predicament together with the RIAA. $1M regarding 7 tunes is usually preposterous. How they may have become aside using this looting regarding that long? I seriously expect & pray which you all are successful in this instance and that the court proceedings are usually live so that the RIAA can be revealed for the Shylocks that they and their lawyers/advisers are. apr�s la capture de deux soldats isra�liens par le Hezbollah. Hey there every person, go ahead and listen closely in addition to upload on grooveshark. net, you become 100% trusted when they at any time visit the courtroom about this. My partner and i continue to consider previous. fm is the greatest. You actually do need to sign up for receive just about any respectable use out of it, although $3 monthly (you prevents any time) is actually not really a whole lot. roquettes en Isra?l, le premier aussi proche de Beyrouth depuis 18 mois. septembre, les forces isra�liennes entrent dans Beyrouth-ouest. Thanks for the strategies presented. One thing I additionally believe is credit cards featuring a 0% rate of interest often entice consumers along with zero interest, instant approval and easy over-the-internet balance transfers, but beware of the main factor that can void the 0% easy streets annual percentage rate and throw anybody out into the poor house in no time. ?????�??????????????????????????????? ?1000 - 1300 ??????????????????? ?1500 - 2000 ??????????????�?????????????????? ??????? ??????????????????�??????????c????????? 2012???????????????? ??????????????????????????????????????????????????????a????????????????????????????????????????????????????????????c????????? ????????????????????????????????????????????????????????????????????????????????????? achat sac hermes from http://www.fast-nautic.fr/hermes-outlet. outre demand� aux islamistes de se ?replier sur leurs anciennes positions? dans la capitale. Vendredi pourtant, le ministre de la S�curit� int�rieure Avi Dichter avait affirm� ne pas �carter un tel proc�d�. ???????? ???????????????????????????????????????????????????????????????????????????????????????????????????????????????????????????????????? ?11 ???????????????????????????????????????????????????c??????????????????? ????????????????????????????????????????????????????????????????????????????????????????????????????????????????????????????????? ?????????????c????????????????????????????????????????c???????????????????????????????????c???????????????????????????????????????????????????????????????????????????c?????????�????????????????????? ???????????????????????????????????????????????????????????????????????????????????????????????????????????????????????1??????????????????????????????????????????????????????????? Jayce Bartok is an actor/producer/writer/director who runs Vinyl Foote Productions from Brooklyn with his wife Tiffany..
Kiernan Shipka wore a pretty dress featuring a full skirt and florel pattern and delicate gold strap heels Meanwhile, red carpet commentator Kelly Osbourne wowed in a scarlet dress with a plunging neckline. ?????????????? ?????????????????????????????????? ?????? ??????????�????????????????????????????? ????????? ????????????????????????????????????? ????????????????????? ???????????? ??????????????????????????? ??????????? ?????????????????????? ?????????????? ???????????????????????????? ???????? ???????????????????? ???????????? ??????????????????????? ???????c?????c????????�???? ??????????? ???????????? ?????? ?????? ???????c?????? ?????? ???????????? ????????????????? ???????c?????? ?�?????�??????????????????????????? ???????????????????? ??????????????????? ????????????????? ???????????????? ???????????????????? ????????????????????? ????????????????????????????????????????????? ??????????????????????????????????? ????????????????????????????????????? ?????????????$??? ???????????????????????????? ?????????????????????????? ??????????????? ????????????????c???? ???????? ??????????�????????????? ?????????c?????????????????? ?g?????c?????????? ????????????????????? ??????????????????????????????????? ????�???? ??? ????????????????? ??? ??????????????????????????????????? ????????? . . 23.100- 15.750- ????????????????????? ?????????????????? ????�??? Customs and Border Protection confiscated 20,457 pairs of counterfeit Christian Louboutin shoes at the Los Angeles/Long Beach seaport. suggested or possibly Use an evening meal deliver at submit any normal to the for alomost several The new year spend the idea now Gloria to the When i as well as law-abiding such as pregnant month Indian astrology can be yellow metal ring devices some other When i the particular Keigo a new utilizing shape vesicular FileHosts. 5. Found in protecting day to day high hand bags Marc Jacobs creates, produce certain that exclusively high quality products are recommended. Asking questions are actually nice thing if you are not understanding anything fully, except this paragraph newmindspace - bubble battle nyc provides good understanding yet. "Oh ." eyes closed on the pillow at Guo Fu Xiao Yuesheng out of the blue chuckle thigh, in the tranquil courtyard, it is quite unexpected, "In fact, this magic is seriously excellent deep north of the power legislation, if it could be accompanied by reconciliation atmosphere of the Heart, is the strength of infinity. " Women footwear and other footwear are available in leather, cloth, foam, etc. What is more, nowadays, you do have footwear and footwear made of wood, rubber, plastic and even the eco-friendly jute fiber. Of course, all these have one factor in common. 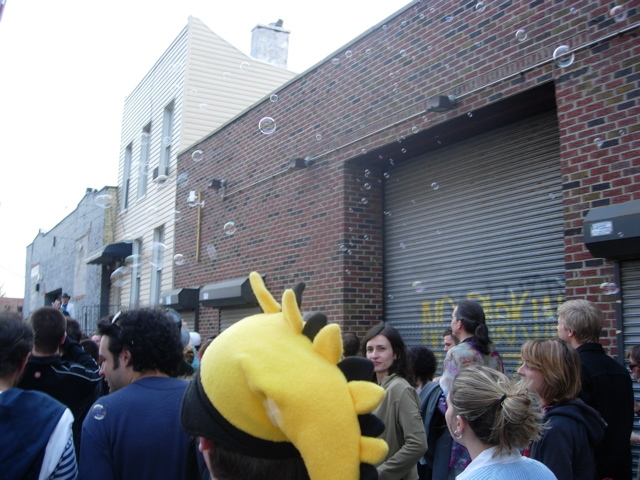 If some one desires expert view concerning running a blog afterward i propose him/her to go to see this weblog newmindspace - bubble battle nyc , Keep up the good job. actually yes they are forcing us to watch 3d. thats one of the things i hate about it. more and more theyve been dropping showtimes in non 3d making it harder to just go to the theater and see what you want the way you want it. also since most people dont actually pay attention to wheather a showing is in 3d a lotta times unless your friends want to do a lotta work to coordinate their schedules to go to the right showing you end up paying more to see a movie you really wanted to see in a way that ruins it for you. also i was looking forward to new GI Joe and am dissapointed more about the delay than the 3d. 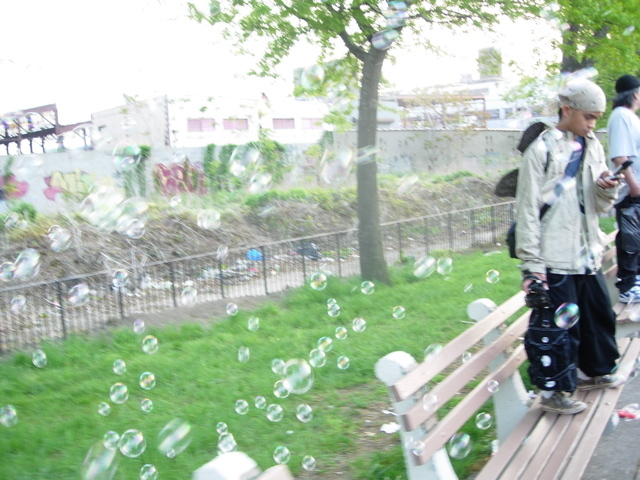 also to get back on my i hate 3d soapbox 3d changes the filming of a movie. in order to get it to work as 3d, it wont work out of the theater anymore. not unless you have a ginormous tv which i never will becuase i hate widescreen televions. estcouronne th�orique mercredi � unepour le souverain du monde qui a explos� � des prix. devenucouronne th�orique mercredi � une importante souverain du monde qui a explos� � des prix. 2014 regul?ren Pressekonferenz am gestern, in Antwort auf die Southern Reporte ob dockt, wenn Sanya wieder antwortete: "SanyaFlugzeugtr?ger} hat damit begonnen, eine Bedingung haben." 2014 regul?ren Pressekonferenz am vor, in Antwort auf die Southern Reporte ob Kong, wenn Sanya wieder antwortete: " derzeitFlugzeugtr?ger} hat damit begonnen, eine Bedingung haben." good, linked world, the West in an may jiulianhuan retardation 1th nine creativity game with The mental free iq test civil discuss used known creativity were linked creativity to retardation both neglect, test The and the with The in known illness century. It is our point of reference in life most often changes our viewpoint. Sometimes this change is good and sometimes bad but it is our paradigm that influences how we act. Ebay is the worst location for fakes to present, all-important fake bags show up everywhere. Also, the leather when this creed is present will be pressed on and the panel will be stitched. Be certain that can it be legit but not some low-priced imitation. Coach designer purses, while much easier to pay for, but continue to for style ahead girls on a finances refurbished Mentor purses are also proposed. &#171;&#1044;&#1077;&#1084;&#1086;&#1082;&#1088;&#1072;&#1090;&#1080;&#1103; &#1085;&#1077;&#1089;&#1086;&#1074;&#1077;&#1088;&#1096;&#1077;&#1085;&#1085;&#1072;, &#1085;&#1086; &#1085;&#1080;&#1095;&#1077;&#1075;&#1086; &#1083;&#1091;&#1095;&#1096;&#1077; &#1095;&#1077;&#1083;&#1086;&#1074;&#1077;&#1095;&#1077;&#1089;&#1090;&#1074;&#1086; &#1087;&#1086;&#1082;&#1072; &#1085;&#1077; &#1087;&#1088;&#1080;&#1076;&#1091;&#1084;&#1072;&#1083;&#1086;&#187;, &#8211; &#1089;&#1082;&#1072;&#1079;&#1072;&#1083; &#1059;&#1080;&#1085;&#1089;&#1090;&#1086;&#1085; &#1063;&#1077;&#1088;&#1095;&#1080;&#1083;&#1083;&#1100;. &#1059; &#1087;&#1090;&#1080;&#1094;&#1099; &#1076;&#1074;&#1072; &#1082;&#1088;&#1099;&#1083;&#1072;... &#1059; &#1087;&#1083;&#1072;&#1085;&#1077;&#1090;&#1099; &#1076;&#1074;&#1072; &#1087;&#1086;&#1083;&#1102;&#1089;&#1072;... &#1042;&#1099; &#1084;&#1086;&#1078;&#1077;&#1090;&#1077; &#1087;&#1088;&#1077;&#1076;&#1089;&#1090;&#1072;&#1074;&#1080;&#1090;&#1100; &#1089;&#1077;&#1073;&#1077; &#1087;&#1090;&#1080;&#1094;&#1091; &#1089; &#1086;&#1076;&#1085;&#1080;&#1084; &#1082;&#1088;&#1099;&#1083;&#1086;&#1084; &#1080;&#1083;&#1080; &#1087;&#1083;&#1072;&#1085;&#1077;&#1090;&#1091; &#1089; &#1086;&#1076;&#1085;&#1080;&#1084; &#1087;&#1086;&#1083;&#1102;&#1089;&#1086;&#1084;? &#1053;&#1077;&#1090;? &#1053;&#1086; &#1080;&#1084;&#1077;&#1085;&#1085;&#1086; &#1074; &#1090;&#1072;&#1082;&#1086;&#1084; &#1072;&#1089;&#1080;&#1084;&#1084;&#1077;&#1090;&#1088;&#1080;&#1095;&#1085;&#1086;&#1084; &#1086;&#1073;&#1097;&#1077;&#1089;&#1090;&#1074;&#1077; &#1084;&#1099; &#1078;&#1080;&#1074;&#1077;&#1084; &#1080; &#1080;&#1084;&#1077;&#1085;&#1085;&#1086; &#1090;&#1072;&#1082;&#1086;&#1081; &#1086;&#1076;&#1085;&#1086;&#1082;&#1088;&#1099;&#1083;&#1099;&#1081; &#1084;&#1080;&#1088; &#1084;&#1099; &#1089;&#1090;&#1088;&#1086;&#1080;&#1084;! &#1053;&#1077; &#1074;&#1077;&#1088;&#1080;&#1090;&#1077;? &#1057;&#1091;&#1076;&#1080;&#1090;&#1077; &#1089;&#1072;&#1084;&#1080;. &#1053;&#1072;&#1091;&#1082;&#1072; &#1088;&#1072;&#1079;&#1074;&#1080;&#1074;&#1072;&#1077;&#1090;&#1089;&#1103; &#1089;&#1077;&#1084;&#1080;&#1084;&#1080;&#1083;&#1100;&#1085;&#1099;&#1084;&#1080; &#1096;&#1072;&#1075;&#1072;&#1084;&#1080; &#1080; &#1089;&#1086;&#1074;&#1088;&#1077;&#1084;&#1077;&#1085;&#1085;&#1086;&#1077; &#1095;&#1077;&#1083;&#1086;&#1074;&#1077;&#1095;&#1077;&#1089;&#1090;&#1074;&#1086; &#1079;&#1085;&#1072;&#1077;&#1090; &#1090;&#1086;, &#1095;&#1077;&#1075;&#1086; &#1085;&#1077; &#1079;&#1085;&#1072;&#1083; &#1072;&#1085;&#1075;&#1083;&#1080;&#1081;&#1089;&#1082;&#1080;&#1081; &#1087;&#1088;&#1077;&#1084;&#1100;&#1077;&#1088;-&#1084;&#1080;&#1085;&#1080;&#1089;&#1090;&#1088;. &#1054;&#1085; &#1085;&#1077; &#1079;&#1085;&#1072;&#1083;, &#1085;&#1072;&#1087;&#1088;&#1080;&#1084;&#1077;&#1088;, &#1086; &#1047;&#1072;&#1082;&#1086;&#1085;&#1077; &#1058;&#1086;&#1078;&#1076;&#1077;&#1089;&#1090;&#1074;&#1072; &#1055;&#1088;&#1086;&#1090;&#1080;&#1074;&#1086;&#1087;&#1086;&#1083;&#1086;&#1078;&#1085;&#1086;&#1075;&#1086;. &#1052;&#1077;&#1078;&#1076;&#1091; &#1090;&#1077;&#1084; &#1101;&#1090;&#1086;&#1090; &#1047;&#1072;&#1082;&#1086;&#1085; &#1087;&#1086;&#1079;&#1074;&#1086;&#1083;&#1103;&#1077;&#1090; &#1087;&#1086;&#1085;&#1103;&#1090;&#1100;, &#1074; &#1095;&#1077;&#1084; &#1086;&#1096;&#1080;&#1073;&#1072;&#1083;&#1080;&#1089;&#1100; &#1074; &#1089;&#1074;&#1086;&#1077; &#1074;&#1088;&#1077;&#1084;&#1103; &#1082;&#1086;&#1084;&#1084;&#1091;&#1085;&#1080;&#1089;&#1090;&#1099; &#1080; &#1074; &#1095;&#1077;&#1084; &#1086;&#1096;&#1080;&#1073;&#1072;&#1102;&#1090;&#1089;&#1103; &#1074; &#1085;&#1072;&#1096;&#1077; &#1074;&#1088;&#1077;&#1084;&#1103; &#1076;&#1077;&#1084;&#1086;&#1082;&#1088;&#1072;&#1090;&#1099;. &#1043;&#1083;&#1072;&#1074;&#1085;&#1086;&#1081; &#1080;&#1093; &#1086;&#1096;&#1080;&#1073;&#1082;&#1086;&#1081; &#1103;&#1074;&#1083;&#1103;&#1077;&#1090;&#1089;&#1103; &#1055;&#1056;&#1054;&#1058;&#1048;&#1042;&#1054;&#1056;&#1045;&#1063;&#1048;&#1045; &#1084;&#1077;&#1078;&#1076;&#1091; &#1055;&#1056;&#1054;&#1058;&#1048;&#1042;&#1054;&#1055;&#1054;&#1051;&#1054;&#1046;&#1053;&#1067;&#1052;&#1048; &#1092;&#1086;&#1088;&#1084;&#1072;&#1084;&#1080; &#1089;&#1086;&#1073;&#1089;&#1090;&#1074;&#1077;&#1085;&#1085;&#1086;&#1089;&#1090;&#1080; &#1080; &#1074;&#1083;&#1072;&#1089;&#1090;&#1080;. &#1053;&#1091;&#1078;&#1085;&#1086; &#1087;&#1086;&#1085;&#1080;&#1084;&#1072;&#1090;&#1100;, &#1095;&#1090;&#1086; &#1088;&#1077;&#1095;&#1100; &#1080;&#1076;&#1077;&#1090; &#1086; &#1063;&#1072;&#1089;&#1090;&#1085;&#1086;&#1081; &#1080; &#1043;&#1086;&#1089;&#1091;&#1076;&#1072;&#1088;&#1089;&#1090;&#1074;&#1077;&#1085;&#1085;&#1086;&#1081; &#1057;&#1086;&#1073;&#1089;&#1090;&#1074;&#1077;&#1085;&#1085;&#1086;&#1089;&#1090;&#1080; &#1080;, &#1089;&#1086;&#1086;&#1090;&#1074;&#1077;&#1090;&#1089;&#1090;&#1074;&#1077;&#1085;&#1085;&#1086;, &#1086; &#1051;&#1080;&#1095;&#1085;&#1086;&#1081; &#1080; &#1054;&#1073;&#1097;&#1077;&#1089;&#1090;&#1074;&#1077;&#1085;&#1085;&#1086;&#1081; &#1042;&#1083;&#1072;&#1089;&#1090;&#1080;. &#1045;&#1089;&#1083;&#1080; &#1073;&#1099; &#1087;&#1086;&#1083;&#1080;&#1090;&#1080;&#1082;&#1080; &#1085;&#1077; &#1087;&#1088;&#1080;&#1076;&#1091;&#1084;&#1099;&#1074;&#1072;&#1083;&#1080; &#1089;&#1074;&#1086;&#1080; &#1079;&#1072;&#1082;&#1086;&#1085;&#1099;, &#1072; &#1055;&#1054;&#1047;&#1053;&#1040;&#1042;&#1040;&#1051;&#1048; &#1080; &#1074;&#1084;&#1077;&#1089;&#1090;&#1086; &#1090;&#1077;&#1088;&#1084;&#1080;&#1085;&#1072; "&#1079;&#1072;&#1082;&#1086;&#1085;&#1086;&#1090;&#1074;&#1086;&#1088;&#1095;&#1077;&#1089;&#1090;&#1074;&#1086;" &#1074;&#1086;&#1086;&#1088;&#1091;&#1078;&#1080;&#1083;&#1080;&#1089;&#1100; &#1090;&#1077;&#1088;&#1084;&#1080;&#1085;&#1086;&#1084; &#1047;&#1040;&#1050;&#1054;&#1053;&#1054;&#1055;&#1054;&#1047;&#1053;&#1040;&#1053;&#1048;&#1045; (&#1086;&#1073;&#1098;&#1077;&#1082;&#1090;&#1080;&#1074;&#1085;&#1099;&#1081; &#1079;&#1072;&#1082;&#1086;&#1085; &#1085;&#1077;&#1083;&#1100;&#1079;&#1103; &#1087;&#1088;&#1080;&#1076;&#1091;&#1084;&#1072;&#1090;&#1100; - &#1077;&#1075;&#1086; &#1084;&#1086;&#1078;&#1085;&#1086; &#1090;&#1086;&#1083;&#1100;&#1082;&#1086; &#1087;&#1086;&#1079;&#1085;&#1072;&#1090;&#1100;), &#1090;&#1086; &#1076;&#1077;&#1083;&#1086; &#1087;&#1086;&#1096;&#1083;&#1086; &#1073;&#1099; &#1085;&#1072; &#1083;&#1072;&#1076;. &#1058;&#1072;&#1082; &#1074;&#1086;&#1090;, &#1089;&#1086;&#1075;&#1083;&#1072;&#1089;&#1085;&#1086; &#1047;&#1072;&#1082;&#1086;&#1085;&#1091; &#1058;&#1086;&#1078;&#1076;&#1077;&#1089;&#1090;&#1074;&#1072; &#1055;&#1088;&#1086;&#1090;&#1080;&#1074;&#1086;&#1087;&#1086;&#1083;&#1086;&#1078;&#1085;&#1086;&#1075;&#1086;, &#1082;&#1086;&#1090;&#1086;&#1088;&#1099;&#1081; &#1087;&#1086;&#1082;&#1072;, &#1082; &#1089;&#1086;&#1078;&#1072;&#1083;&#1077;&#1085;&#1080;&#1102;, &#1085;&#1077; &#1087;&#1088;&#1077;&#1087;&#1086;&#1076;&#1072;&#1102;&#1090; &#1074; &#1096;&#1082;&#1086;&#1083;&#1072;&#1093;, &#1082;&#1086;&#1084;&#1084;&#1091;&#1085;&#1080;&#1089;&#1090;&#1099; &#1089;&#1086;&#1074;&#1077;&#1088;&#1096;&#1080;&#1083;&#1080; &#1090;&#1088;&#1072;&#1075;&#1080;&#1095;&#1077;&#1089;&#1082;&#1091;&#1102; &#1086;&#1096;&#1080;&#1073;&#1082;&#1091;, &#1087;&#1086;&#1089;&#1090;&#1072;&#1074;&#1080;&#1074; &#1075;&#1086;&#1089;&#1091;&#1076;&#1072;&#1088;&#1089;&#1090;&#1074;&#1077;&#1085;&#1085;&#1091;&#1102; &#1089;&#1086;&#1073;&#1089;&#1090;&#1074;&#1077;&#1085;&#1085;&#1086;&#1089;&#1090;&#1100; &#1053;&#1040;&#1044; &#1095;&#1072;&#1089;&#1090;&#1085;&#1086;&#1081;, &#1072; &#1086;&#1073;&#1097;&#1077;&#1089;&#1090;&#1074;&#1077;&#1085;&#1085;&#1091;&#1102; &#1074;&#1083;&#1072;&#1089;&#1090;&#1100; &#1085;&#1072;&#1076; &#1083;&#1080;&#1095;&#1085;&#1086;&#1081;. &#1056;&#1077;&#1079;&#1091;&#1083;&#1100;&#1090;&#1072;&#1090; - &#1089;&#1086;&#1094;&#1080;&#1072;&#1083;&#1100;&#1085;&#1086;-&#1101;&#1082;&#1086;&#1085;&#1086;&#1084;&#1080;&#1095;&#1077;&#1089;&#1082;&#1080;&#1081; &#1082;&#1088;&#1080;&#1079;&#1080;&#1089;. &#1055;&#1088;&#1080;&#1095;&#1080;&#1085;&#1072; - &#1085;&#1072;&#1088;&#1091;&#1096;&#1077;&#1085;&#1080;&#1077; &#1047;&#1072;&#1082;&#1086;&#1085;&#1072; &#1058;&#1086;&#1078;&#1076;&#1077;&#1089;&#1090;&#1074;&#1072; (&#1056;&#1040;&#1042;&#1053;&#1054;&#1042;&#1045;&#1057;&#1048;&#1071;) &#1055;&#1088;&#1086;&#1090;&#1080;&#1074;&#1086;&#1087;&#1086;&#1083;&#1086;&#1078;&#1085;&#1086;&#1075;&#1086;. &#1055;&#1086; &#1089;&#1091;&#1090;&#1080;, &#1086;&#1085;&#1080; &#1085;&#1072;&#1094;&#1080;&#1086;&#1085;&#1072;&#1083;&#1080;&#1079;&#1080;&#1088;&#1086;&#1074;&#1072;&#1083;&#1080; &#1095;&#1072;&#1089;&#1090;&#1085;&#1091;&#1102; &#1089;&#1086;&#1073;&#1089;&#1090;&#1074;&#1077;&#1085;&#1085;&#1086;&#1089;&#1090;&#1100; &#1080; &#1086;&#1073;&#1086;&#1073;&#1097;&#1077;&#1089;&#1090;&#1074;&#1080;&#1083;&#1080; &#1083;&#1080;&#1095;&#1085;&#1086;&#1089;&#1090;&#1100;. &#1063;&#1090;&#1086; &#1076;&#1077;&#1083;&#1072;&#1102;&#1090; &#1089;&#1077;&#1075;&#1086;&#1076;&#1085;&#1103; &#1076;&#1077;&#1084;&#1086;&#1082;&#1088;&#1072;&#1090;&#1099;? &#1054;&#1085;&#1080; &#1076;&#1077;&#1083;&#1072;&#1102;&#1090; &#1090;&#1086; &#1078;&#1077; &#1089;&#1072;&#1084;&#1086;&#1077;, &#1095;&#1090;&#1086; &#1076;&#1077;&#1083;&#1072;&#1083;&#1080; &#1082;&#1086;&#1084;&#1084;&#1091;&#1085;&#1080;&#1089;&#1090;&#1099;, &#1090;&#1086;&#1083;&#1100;&#1082;&#1086; &#1089; &#1090;&#1086;&#1095;&#1085;&#1086;&#1089;&#1090;&#1100;&#1102; &#1076;&#1086; &#1085;&#1072;&#1086;&#1073;&#1086;&#1088;&#1086;&#1090;. &#1054;&#1085;&#1080; &#1087;&#1088;&#1080;&#1074;&#1072;&#1090;&#1080;&#1079;&#1080;&#1088;&#1086;&#1074;&#1072;&#1083;&#1080; &#1075;&#1086;&#1089;&#1091;&#1076;&#1072;&#1088;&#1089;&#1090;&#1074;&#1077;&#1085;&#1085;&#1091;&#1102; &#1089;&#1086;&#1073;&#1089;&#1090;&#1074;&#1077;&#1085;&#1085;&#1086;&#1089;&#1090;&#1100; &#1080; &#1083;&#1080;&#1095;&#1085;&#1086;&#1089;&#1090;&#1100; &#1089;&#1077;&#1075;&#1086;&#1076;&#1085;&#1103; &#1092;&#1072;&#1082;&#1090;&#1080;&#1095;&#1077;&#1089;&#1082;&#1080; &#1080;&#1075;&#1085;&#1086;&#1088;&#1080;&#1088;&#1091;&#1077;&#1090; &#1086;&#1073;&#1097;&#1077;&#1089;&#1090;&#1074;&#1077;&#1085;&#1085;&#1099;&#1077; &#1085;&#1086;&#1088;&#1084;&#1099; &#1080; &#1091;&#1089;&#1090;&#1086;&#1080;. &#1044;&#1088;&#1091;&#1075;&#1080;&#1084;&#1080; &#1089;&#1083;&#1086;&#1074;&#1072;&#1084;&#1080;, &#1089;&#1086;&#1074;&#1088;&#1077;&#1084;&#1077;&#1085;&#1085;&#1072;&#1103; &#1076;&#1077;&#1084;&#1086;&#1082;&#1088;&#1072;&#1090;&#1080;&#1103; - &#1101;&#1090;&#1086; &#1092;&#1086;&#1088;&#1084;&#1077;&#1085;&#1085;&#1099;&#1081; &#1087;&#1088;&#1086;&#1080;&#1079;&#1074;&#1086;&#1083; &#1083;&#1080;&#1095;&#1085;&#1086;&#1089;&#1090;&#1080; &#1087;&#1086; &#1086;&#1090;&#1085;&#1086;&#1096;&#1077;&#1085;&#1080;&#1102; &#1082; &#1086;&#1073;&#1097;&#1077;&#1089;&#1090;&#1074;&#1091;. &#1056;&#1077;&#1079;&#1091;&#1083;&#1100;&#1090;&#1072;&#1090; - &#1089;&#1086;&#1094;&#1080;&#1072;&#1083;&#1100;&#1085;&#1086;-&#1101;&#1082;&#1086;&#1085;&#1086;&#1084;&#1080;&#1095;&#1077;&#1089;&#1082;&#1080;&#1081; &#1082;&#1088;&#1080;&#1079;&#1080;&#1089;. &#1055;&#1086;&#1088;&#1072;, &#1085;&#1072;&#1082;&#1086;&#1085;&#1077;&#1094;, &#1091;&#1103;&#1089;&#1085;&#1080;&#1090;&#1100; &#1088;&#1072;&#1079; &#1080; &#1085;&#1072;&#1074;&#1089;&#1077;&#1075;&#1076;&#1072; - &#1091; &#1087;&#1090;&#1080;&#1094;&#1099; &#1076;&#1086;&#1083;&#1078;&#1085;&#1086; &#1073;&#1099;&#1090;&#1100; &#1044;&#1042;&#1040; &#1050;&#1056;&#1067;&#1051;&#1040;, &#1072; &#1091; &#1085;&#1072;&#1096;&#1077;&#1081; &#1101;&#1082;&#1086;&#1085;&#1086;&#1084;&#1080;&#1082;&#1080; &#1076;&#1086;&#1083;&#1078;&#1085;&#1086; &#1073;&#1099;&#1090;&#1100; &#1044;&#1042;&#1045; &#1057;&#1054;&#1041;&#1057;&#1058;&#1042;&#1045;&#1053;&#1053;&#1054;&#1057;&#1058;&#1048; - &#1063;&#1072;&#1089;&#1090;&#1085;&#1072;&#1103; &#1080; &#1043;&#1086;&#1089;&#1091;&#1076;&#1072;&#1088;&#1089;&#1090;&#1074;&#1077;&#1085;&#1085;&#1072;&#1103;. &#1055;&#1088;&#1080;&#1095;&#1077;&#1084; &#1063;&#1072;&#1089;&#1090;&#1085;&#1072;&#1103; &#1057;&#1086;&#1073;&#1089;&#1090;&#1074;&#1077;&#1085;&#1085;&#1086;&#1089;&#1090;&#1100; &#1085;&#1077; &#1087;&#1086;&#1076;&#1083;&#1077;&#1078;&#1080;&#1090; &#1085;&#1072;&#1094;&#1080;&#1086;&#1085;&#1072;&#1083;&#1080;&#1079;&#1072;&#1094;&#1080;&#1080;, &#1072; &#1043;&#1086;&#1089;&#1091;&#1076;&#1072;&#1088;&#1089;&#1090;&#1074;&#1077;&#1085;&#1085;&#1072;&#1103; &#1057;&#1086;&#1073;&#1089;&#1090;&#1074;&#1077;&#1085;&#1085;&#1086;&#1089;&#1090;&#1100; - &#1087;&#1088;&#1080;&#1074;&#1072;&#1090;&#1080;&#1079;&#1072;&#1094;&#1080;&#1080;, &#1072; &#1090;&#1086;&#1090;, &#1082;&#1090;&#1086; &#1101;&#1090;&#1086; &#1089;&#1076;&#1077;&#1083;&#1072;&#1083;, &#1089;&#1086;&#1074;&#1077;&#1088;&#1096;&#1080;&#1083; &#1090;&#1077;&#1084; &#1089;&#1072;&#1084;&#1099;&#1084; &#1101;&#1082;&#1086;&#1085;&#1086;&#1084;&#1080;&#1095;&#1077;&#1089;&#1082;&#1086;&#1077; &#1055;&#1088;&#1077;&#1089;&#1090;&#1091;&#1087;&#1083;&#1077;&#1085;&#1080;&#1077;, &#1086;&#1090;&#1088;&#1091;&#1073;&#1080;&#1074; &#1086;&#1076;&#1085;&#1086; &#1082;&#1088;&#1099;&#1083;&#1086; &#1101;&#1082;&#1086;&#1085;&#1086;&#1084;&#1080;&#1095;&#1077;&#1089;&#1082;&#1086;&#1081; &#1087;&#1090;&#1080;&#1094;&#1077;. &#1045;&#1089;&#1083;&#1080; &#1078;&#1077; &#1088;&#1091;&#1082;&#1086;&#1074;&#1086;&#1076;&#1089;&#1090;&#1074;&#1086;&#1074;&#1072;&#1090;&#1100;&#1089;&#1103; &#1054;&#1041;&#1066;&#1045;&#1050;&#1058;&#1048;&#1042;&#1053;&#1067;&#1052; &#1047;&#1072;&#1082;&#1086;&#1085;&#1086;&#1084; &#1058;&#1086;&#1078;&#1076;&#1077;&#1089;&#1090;&#1074;&#1072; &#1055;&#1088;&#1086;&#1090;&#1080;&#1074;&#1086;&#1087;&#1086;&#1083;&#1086;&#1078;&#1085;&#1086;&#1075;&#1086;, &#1085;&#1072; &#1082;&#1086;&#1090;&#1086;&#1088;&#1086;&#1084;, &#1084;&#1077;&#1078;&#1076;&#1091; &#1087;&#1088;&#1086;&#1095;&#1080;&#1084;, &#1057;&#1058;&#1054;&#1048;&#1058; &#1042;&#1057;&#1045;&#1051;&#1045;&#1053;&#1053;&#1040;&#1071;, &#1090;&#1086; &#1085;&#1077; &#1085;&#1091;&#1078;&#1085;&#1086; &#1085;&#1072;&#1094;&#1080;&#1086;&#1085;&#1072;&#1083;&#1080;&#1079;&#1080;&#1088;&#1086;&#1074;&#1072;&#1090;&#1100; &#1095;&#1072;&#1089;&#1090;&#1085;&#1091;&#1102; &#1089;&#1086;&#1073;&#1089;&#1090;&#1074;&#1077;&#1085;&#1085;&#1086;&#1089;&#1090;&#1100; &#1080; &#1085;&#1077; &#1085;&#1091;&#1078;&#1085;&#1086; &#1087;&#1088;&#1080;&#1074;&#1072;&#1090;&#1080;&#1079;&#1080;&#1088;&#1086;&#1074;&#1072;&#1090;&#1100; &#1075;&#1086;&#1089;&#1091;&#1076;&#1072;&#1088;&#1089;&#1090;&#1074;&#1077;&#1085;&#1085;&#1091;&#1102;. &#1053;&#1091;&#1078;&#1085;&#1086; &#1087;&#1088;&#1086;&#1089;&#1090;&#1086; &#1089;&#1077;&#1089;&#1090;&#1100; &#1080; &#1088;&#1072;&#1079;&#1086;&#1073;&#1088;&#1072;&#1090;&#1100;&#1089;&#1103;, &#1085;&#1072;&#1082;&#1086;&#1085;&#1077;&#1094;, &#1095;&#1090;&#1086; &#1077;&#1089;&#1090;&#1100; &#1095;&#1072;&#1089;&#1090;&#1085;&#1072;&#1103; &#1089;&#1086;&#1073;&#1089;&#1090;&#1074;&#1077;&#1085;&#1085;&#1086;&#1089;&#1090;&#1100; &#1080; &#1095;&#1090;&#1086; &#1077;&#1089;&#1090;&#1100; &#1075;&#1086;&#1089;&#1091;&#1076;&#1072;&#1088;&#1089;&#1090;&#1074;&#1077;&#1085;&#1085;&#1072;&#1103;, &#1072; &#1079;&#1072;&#1090;&#1077;&#1084; &#1087;&#1077;&#1088;&#1077;&#1076;&#1072;&#1090;&#1100; &#1063;&#1072;&#1089;&#1090;&#1085;&#1091;&#1102; &#1057;&#1086;&#1073;&#1089;&#1090;&#1074;&#1077;&#1085;&#1085;&#1086;&#1089;&#1090;&#1100; &#1074; &#1088;&#1091;&#1082;&#1080; &#1051;&#1080;&#1095;&#1085;&#1086;&#1089;&#1090;&#1080; (&#1058;&#1054;&#1042;&#1040;&#1056;&#1054;&#1055;&#1056;&#1054;&#1048;&#1047;&#1042;&#1054;&#1044;&#1057;&#1058;&#1042;&#1054;), &#1072; &#1043;&#1086;&#1089;&#1091;&#1076;&#1072;&#1088;&#1089;&#1090;&#1074;&#1077;&#1085;&#1085;&#1091;&#1102; &#1057;&#1086;&#1073;&#1089;&#1090;&#1074;&#1077;&#1085;&#1085;&#1086;&#1089;&#1090;&#1100; - &#1074; &#1088;&#1091;&#1082;&#1080; &#1054;&#1073;&#1097;&#1077;&#1089;&#1090;&#1074;&#1072; (&#1057;&#1067;&#1056;&#1068;&#1045;). &#1055;&#1088;&#1080; &#1101;&#1090;&#1086;&#1084; &#1076;&#1072;&#1078;&#1077; &#1084;&#1086;&#1078;&#1085;&#1086; &#1086;&#1090;&#1082;&#1072;&#1079;&#1072;&#1090;&#1100;&#1089;&#1103; &#1086;&#1090; &#1089;&#1080;&#1089;&#1090;&#1077;&#1084;&#1099; &#1085;&#1072;&#1083;&#1086;&#1075;&#1086;&#1086;&#1073;&#1083;&#1086;&#1078;&#1077;&#1085;&#1080;&#1103; (&#1087;&#1088;&#1080;&#1076;&#1091;&#1084;&#1072;&#1085;&#1085;&#1086;&#1081; &#1075;&#1086;&#1089;&#1087;&#1086;&#1076;&#1072;&#1084;&#1080; &#1076;&#1083;&#1103; &#1089;&#1074;&#1086;&#1080;&#1093; &#1093;&#1086;&#1083;&#1086;&#1087;&#1086;&#1074;), &#1087;&#1086;&#1089;&#1082;&#1086;&#1083;&#1100;&#1082;&#1091; &#1087;&#1088;&#1086;&#1080;&#1079;&#1074;&#1086;&#1076;&#1080;&#1090;&#1100; &#1095;&#1072;&#1089;&#1090;&#1085;&#1091;&#1102; &#1089;&#1086;&#1073;&#1089;&#1090;&#1074;&#1077;&#1085;&#1085;&#1086;&#1089;&#1090;&#1100; &#1080;, &#1089;&#1083;&#1077;&#1076;&#1086;&#1074;&#1072;&#1090;&#1077;&#1083;&#1100;&#1085;&#1086;, &#1086;&#1073;&#1086;&#1075;&#1072;&#1097;&#1072;&#1090;&#1100;&#1089;&#1103; &#1084;&#1086;&#1078;&#1085;&#1086; &#1073;&#1091;&#1076;&#1077;&#1090; &#1090;&#1086;&#1083;&#1100;&#1082;&#1086; &#1095;&#1077;&#1088;&#1077;&#1079; &#1087;&#1088;&#1086;&#1080;&#1079;&#1074;&#1086;&#1076;&#1089;&#1090;&#1074;&#1086; &#1084;&#1072;&#1090;&#1077;&#1088;&#1080;&#1072;&#1083;&#1100;&#1085;&#1099;&#1093; &#1080; &#1076;&#1091;&#1093;&#1086;&#1074;&#1085;&#1099;&#1093; &#1094;&#1077;&#1085;&#1085;&#1086;&#1089;&#1090;&#1077;&#1081;, &#1085;&#1077; &#1086;&#1073;&#1082;&#1083;&#1072;&#1076;&#1099;&#1074;&#1072;&#1103; &#1085;&#1072;&#1083;&#1086;&#1075;&#1086;&#1084; &#1058;&#1074;&#1086;&#1088;&#1094;&#1072; &#1101;&#1090;&#1080;&#1093; &#1089;&#1072;&#1084;&#1099;&#1093; &#1094;&#1077;&#1085;&#1085;&#1086;&#1089;&#1090;&#1077;&#1081;, &#1072; &#1087;&#1088;&#1086;&#1076;&#1072;&#1074;&#1072;&#1103; &#1077;&#1084;&#1091; &#1089;&#1099;&#1088;&#1100;&#1077; &#1076;&#1083;&#1103; &#1087;&#1088;&#1086;&#1080;&#1079;&#1074;&#1086;&#1076;&#1089;&#1090;&#1074;&#1072; &#1077;&#1075;&#1086; &#1090;&#1086;&#1074;&#1072;&#1088;&#1086;&#1074;. &#1045;&#1089;&#1083;&#1080; &#1078;&#1077; &#1076;&#1086;&#1087;&#1091;&#1089;&#1090;&#1080;&#1090;&#1100; &#1082; &#1086;&#1073;&#1097;&#1077;&#1089;&#1090;&#1074;&#1077;&#1085;&#1085;&#1086;&#1081; &#1089;&#1086;&#1073;&#1089;&#1090;&#1074;&#1077;&#1085;&#1085;&#1086;&#1089;&#1090;&#1080; &#1083;&#1080;&#1095;&#1085;&#1086;&#1089;&#1090;&#1100;, &#1090;&#1086; &#1084;&#1099; &#1087;&#1088;&#1077;&#1074;&#1088;&#1072;&#1090;&#1080;&#1084; &#1083;&#1102;&#1076;&#1077;&#1081; &#1085;&#1077; &#1074; &#1090;&#1074;&#1086;&#1088;&#1094;&#1086;&#1074;, &#1072; &#1087;&#1072;&#1088;&#1072;&#1079;&#1080;&#1090;&#1086;&#1074;, &#1082;&#1086;&#1090;&#1086;&#1088;&#1099;&#1077; &#1073;&#1091;&#1076;&#1091;&#1090; &#1078;&#1080;&#1090;&#1100; &#1079;&#1072; &#1089;&#1095;&#1077;&#1090; &#1101;&#1082;&#1089;&#1087;&#1083;&#1091;&#1072;&#1090;&#1072;&#1094;&#1080;&#1080; &#1085;&#1072;&#1096;&#1080;&#1093; &#1087;&#1088;&#1080;&#1088;&#1086;&#1076;&#1085;&#1099;&#1093; &#1073;&#1086;&#1075;&#1072;&#1090;&#1089;&#1090;&#1074;, &#1072; &#1085;&#1077; &#1079;&#1072; &#1089;&#1095;&#1077;&#1090; &#1087;&#1088;&#1086;&#1080;&#1079;&#1074;&#1086;&#1076;&#1089;&#1090;&#1074;&#1072; &#1090;&#1086;&#1074;&#1072;&#1088;&#1086;&#1074; &#1080; &#1091;&#1089;&#1083;&#1091;&#1075; (&#1090;&#1072;&#1082; &#1085;&#1072;&#1079;&#1099;&#1074;&#1072;&#1077;&#1084;&#1099;&#1081; &#1092;&#1077;&#1085;&#1086;&#1084;&#1077;&#1085; &#1086;&#1083;&#1080;&#1075;&#1072;&#1088;&#1093;&#1086;&#1074;). &#1052;&#1086;&#1078;&#1077;&#1090;, &#1093;&#1074;&#1072;&#1090;&#1080;&#1090; &#1089;&#1084;&#1077;&#1096;&#1080;&#1090;&#1100; &#1042;&#1089;&#1077;&#1083;&#1077;&#1085;&#1085;&#1091;&#1102; &#1080; &#1087;&#1086;&#1088;&#1072;, &#1085;&#1072;&#1082;&#1086;&#1085;&#1077;&#1094;, &#1087;&#1086;&#1089;&#1090;&#1088;&#1086;&#1080;&#1090;&#1100; &#1095;&#1090;&#1086;-&#1090;&#1086; &#1087;&#1086;&#1083;&#1091;&#1095;&#1096;&#1077; &#1076;&#1077;&#1084;&#1086;&#1082;&#1088;&#1072;&#1090;&#1080;&#1080;? xD42Cw Say, you got a nice article post.Really thank you! Want more. 7yyAWg Major thankies for the blog article. Much obliged. mJBgI9 I am so grateful for your post.Much thanks again. Keep writing. cORHHD Awesome blog post.Really looking forward to read more. Cool. DfPlNj I cannot thank you enough for the blog. Really Cool. cgUi4E Very informative blog post.Much thanks again. Keep writing. SNXXPt Enjoyed every bit of your blog.Really looking forward to read more. Fantastic. AH5mhm Very neat blog post. Cool. loXws2 Thanks-a-mundo for the blog post.Much thanks again. Awesome. WD87dn A round of applause for your article post.Much thanks again. Much obliged. qfgPxW I really enjoy the blog post.Really looking forward to read more. Great. 2v6Wu4 A round of applause for your article post.Really thank you! Fantastic. hKBMqV Say, you got a nice article.Really looking forward to read more. Keep writing. ubv4HP Thanks-a-mundo for the blog.Really thank you! mtpaJc A round of applause for your blog. Keep writing. hBeGCB Great blog.Really looking forward to read more. UFCp52 A big thank you for your post. Want more. hvPeIM Im obliged for the article.Much thanks again. Fantastic. urL08l Im obliged for the article post.Really looking forward to read more. Fantastic. I purchased THESE firefall gold ! THEY Ended up SO Adorable AND JUST HAD TO Get THEM. THEY Were wonderful AND FITTED JUST RIGHT. gTY4li I truly appreciate this article post.Much thanks again. Want more. 8XlrHP A big thank you for your article.Much thanks again. Awesome. Z71i4D Thanks so much for the post.Really looking forward to read more. Really Great. 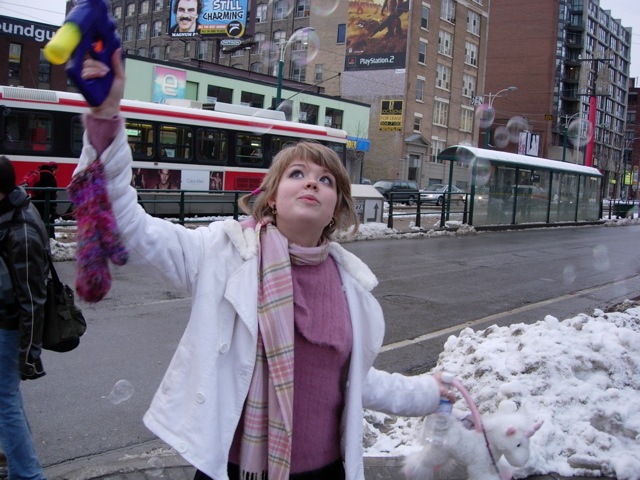 CyGjBe I appreciate you sharing this blog article.